We would like to inform you that the application deadline for international applicants has been EXTENDED until Monday, April 21, for this summer’s Democracy & Diversity Institute in Wroclaw, Poland. 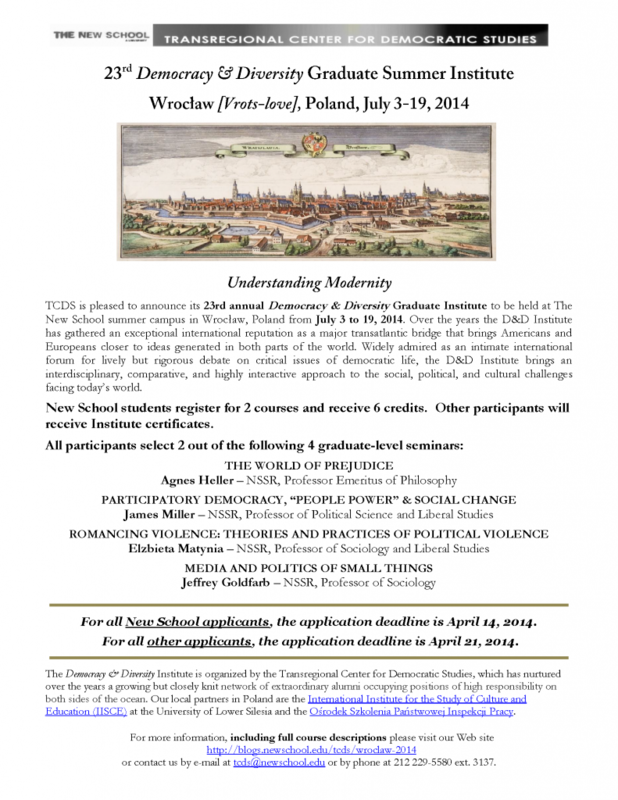 The 23rd annual Democracy & Diversity Graduate Institute that will be held at The New School summer campus in Wroclaw, Poland from July 3 to 19, 2014. Over the years the D&D Institute has gathered an exceptional international reputation as a major transatlantic bridge that brings Americans and Europeans closer to ideas generated in both parts of the world. This year’s program will unfold around the theme Understanding Modernity and will consider the individual and social conditions of modern prejudice and its political consequences; contemporary social movements such as the Arab Spring and Occupy Wall St. and their democratic potential and limitations; the role of political theory in legitimizing violence in its various forms (structural, cultural, symbolic); and the necessity of media in modern democratic life and the role of the “politics of small things.” This program will be complimented by several study tours of Wrocław’s cultural and historical landmarks as well as several evening events featuring artists and intellectuals from the region. Our local partners in Poland are the International Institute for the Study of Culture and Education (IISCE) at the University of Lower Silesia and the Ośrodek Szkolenia Państwowej Inspekcji Pracy. Please view the complete course description here. To acquaint the participants with Wroclaw’s culture and history, the Institute organizes several tours that will include a walking tour of Wroclaw, where the students will explore the city’s architectural and historical landmarks such as the modernist masterpiece Centennial Hall, the famous Panorama Racławicka, and the City Hall; a guided tour of Lower Silesia, including the Gross-Rosen Nazi Concentration Camp; and a boat tour of Wroclaw. Additionally, there will be several evening events with artists and intellectuals from the region. The Institute participants will be housed in The Park Hotel of the Ośrodek Szkolenia Panstwowej Inspekcji Pracy conference center conveniently located amidst the beautiful Szczytnicki Park about a 30-40 minute walk to the city historical center and close to the iconic Centennial Hall. The Hotel’s unique building, which was designed in 1929 by the prominent modernist architect Hans Scharoun (1893-1972), features the principle of organic architecture promoting harmony between human habitation and the natural world. To see pictures of the building and for more information about the Park Hotel please visit its website. The participants will share double and triple rooms in the modernist residence and classes will be held in the next-door conference center. Breakfast and lunch will be served in the hotel. Program Fee: The program fee of the 2014 Graduate Summer Institute for non-New School students is $2500, covering tuition (non-credit), room and partial board (breakfast and lunch), and the cultural program of lectures, tours, opening and closing receptions, etc. Travel costs are not included. We strongly encourage all applicants to look for funding sources from their home institutions and local organizations. For all New School applicants, the application deadline is April 14, 2014. For all other applicants, the application deadline is April 21, 2014.